Welcome back to the final segment on our tour of my friend Jodie’s house. 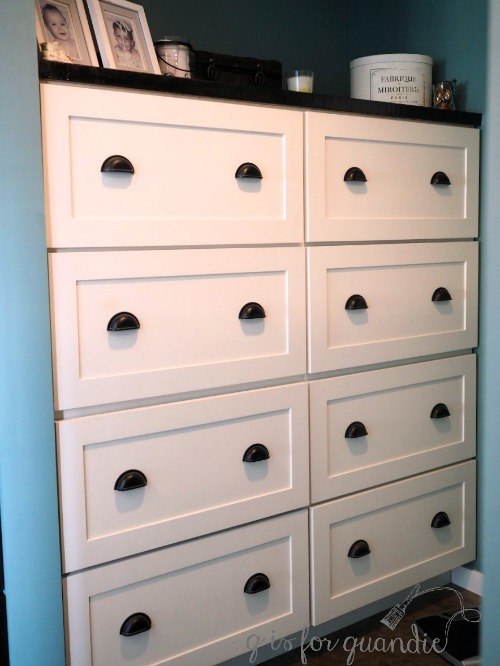 All that we have left to see is her master suite, so let’s get started! I have to say, there are lots of great features in Jodie & Doug’s master, but it’s very hard for any of them to compete with the view from that amazing wall of windows. Can you just imagine how gorgeous that view is when there is a freshly fallen snow? Or, like the first time I visited, in the fall with brilliantly colored leaves on all of the trees? I had to tear myself away from that view to get photos of the rest of the room. I also had to shut the drapes because the room was drenched in sunlight and I was having trouble getting good photos! I’m really quite envious of all of the beautiful light in this room. 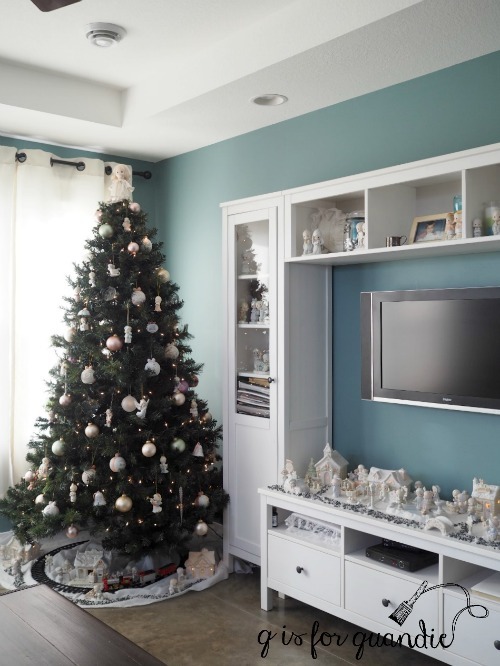 You’ve already seen that Jodie has a Christmas tree in the living room, each of her boys has a tree in his room, and yes, there is one in the master bedroom too. You see, Jodie has been collecting (or should I say non-collecting?) Precious Moments since 1984. She received her first one from her pen pal in New Jersey! 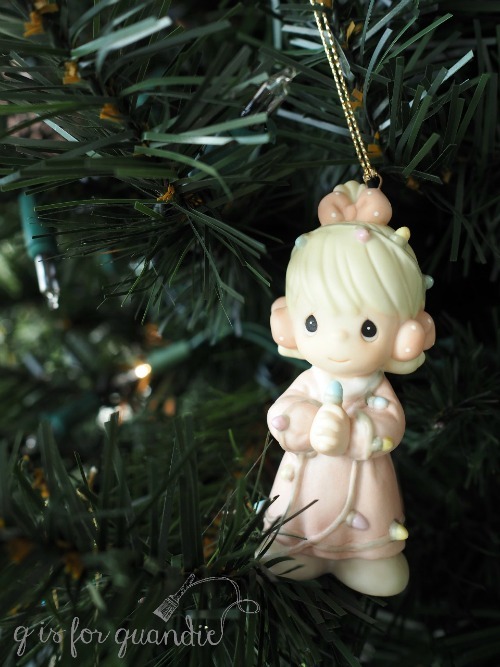 Living in a household full of men, she thinks maybe the Precious Moment ornaments are just a tad too … well … precious for the family tree in the living room so she keeps them all on a tree in here. 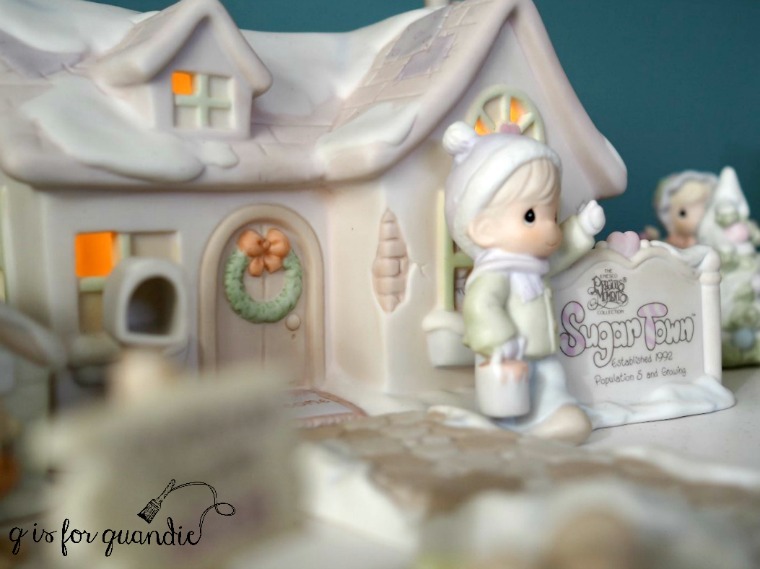 Not only does she have lots of ornaments, she also has the Sugar Town. 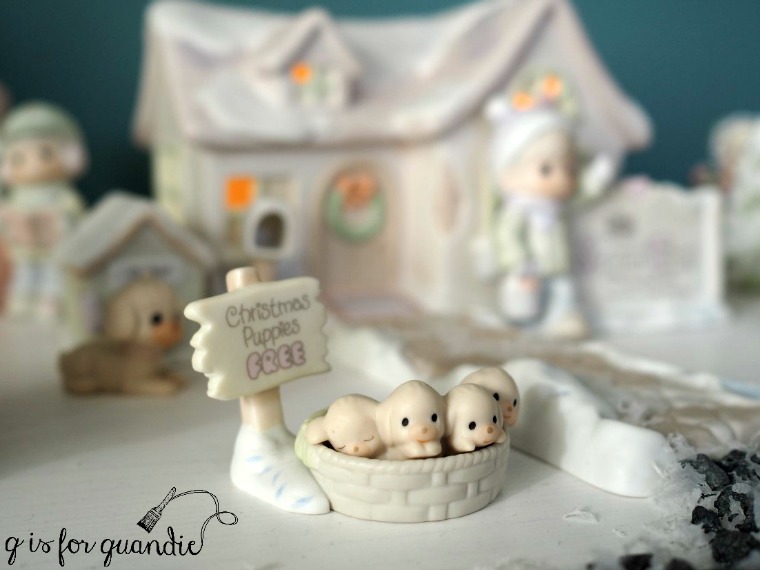 I can see why they call it the Sugar Town because some of the pieces are just adorably sweet, like the free Christmas puppies. Obviously the driver of this car couldn’t resist one of the free puppies! 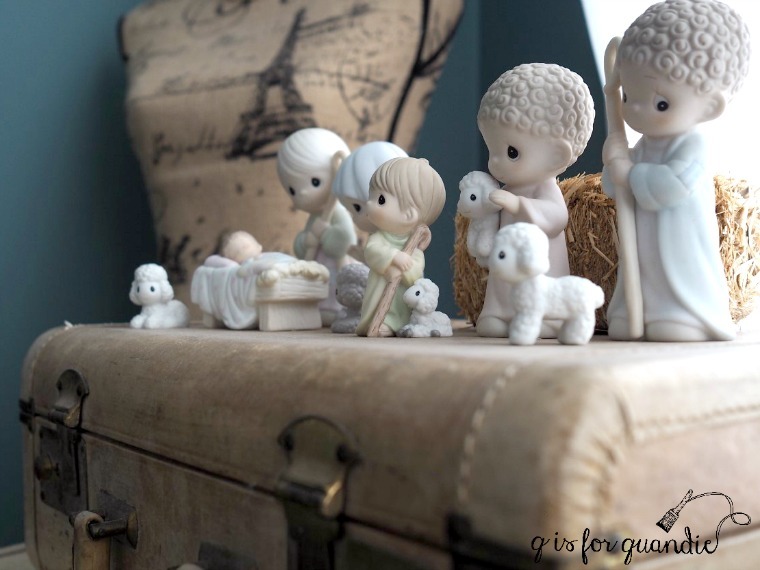 I love the way that Jodie has displayed the nativity scene on a stack of vintage suitcases. 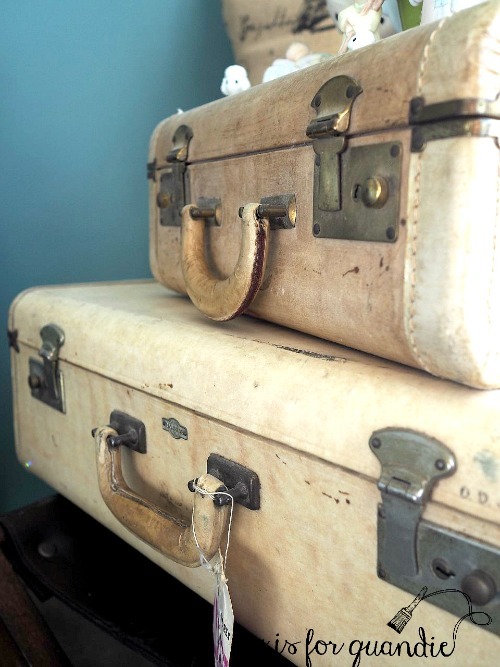 But then, I just have a weakness for vintage suitcases period, and these are awesome. This is a pair that I would definitely never paint. Jodie and Doug’s master bath is fantastic. So much space! Have I mentioned that I have the world’s smallest bathroom? I always wonder, do people get cold in the winter when their bathroom is this large? I mean, the steam from the shower just isn’t going to heat up the entire space, right? Maybe Jodie will answer that question for me. I’m sure those heated concrete floors help. Isn’t the tub area fab? I saw the idea for ‘get naked’ on pinterest and shared it with Jodie. 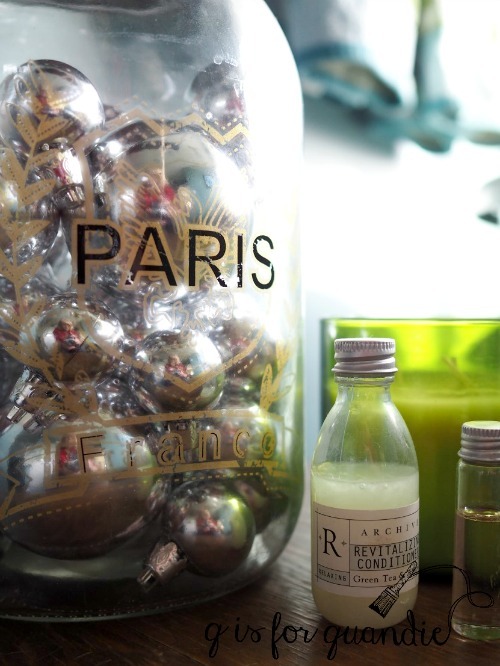 I love that she used it, doesn’t it add a bit of whimsy to the space? And hey, there is the rest of that ladder! Remember we saw a section of it hanging from the ceiling in the laundry room, and then another section leaning on the wall in Blake’s room. 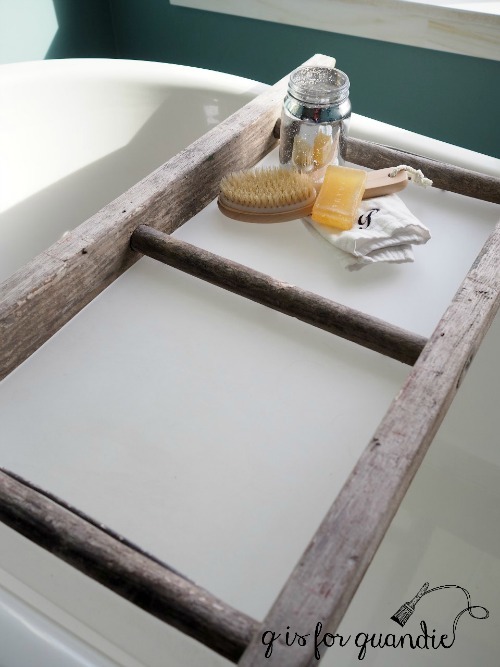 Doug turned it into a bathtub caddy by adding a plexi-glass bottom and shaping it to fit the sides of the tub. 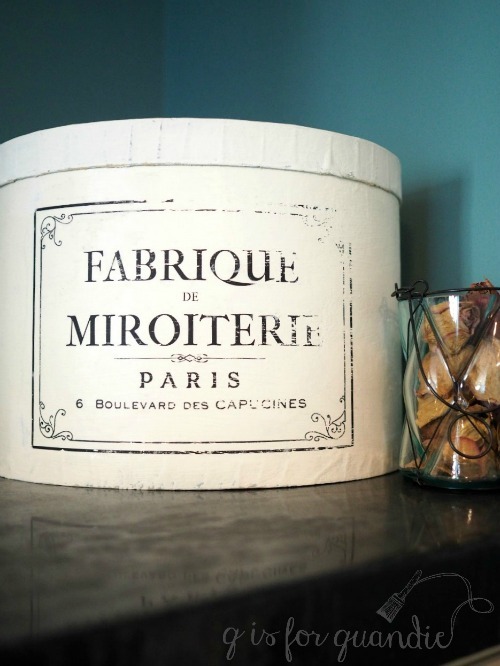 I really love this jar next to the tub, isn’t it gorgeous? And hey, what is that I spy on top of the built in? It’s one of my very first painted hat boxes! Jodie has amazing taste, doesn’t she? Wink, wink. By the way, the dried roses in the container next to the hat box are from Jodie’s dad’s funeral. She has kept them for all of these years. A big thank you to Doug & Jodie for letting us take this tour of their house. 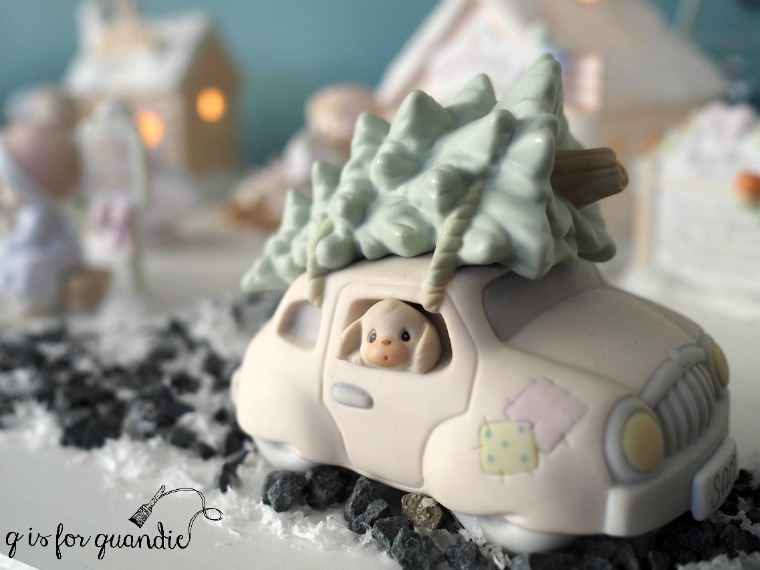 Jodie has incorporated so many clever decorating ideas, I hope some of you have been inspired by some of those ideas yourselves! 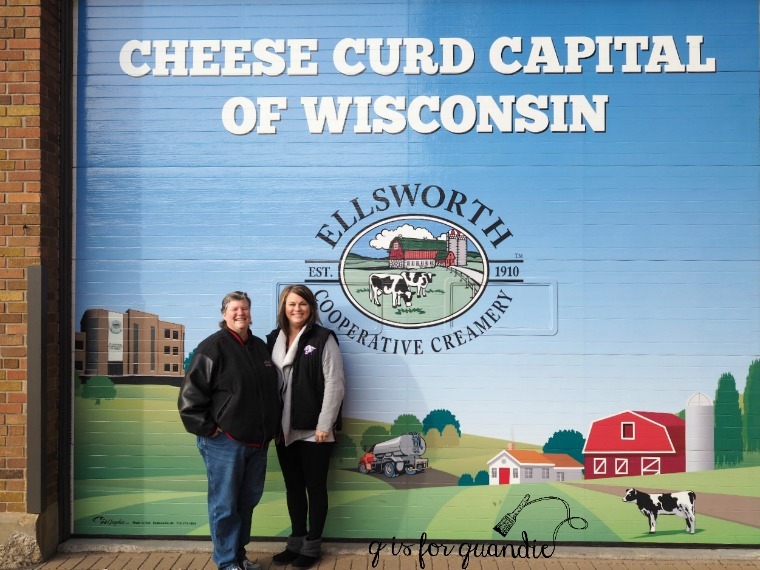 But wait, before Debbie and I head back across the border to Minnesota, no trip to Ellsworth would be complete without stopping at the Creamery to buy cheese curds. After all, Ellsworth is the cheese curd capital of Wisconsin! Previous adding the gleam of copper. What a beautiful home. I would love to have a master bathroom like that. I also love the floors throughout the whole house (warm and easy to clean). 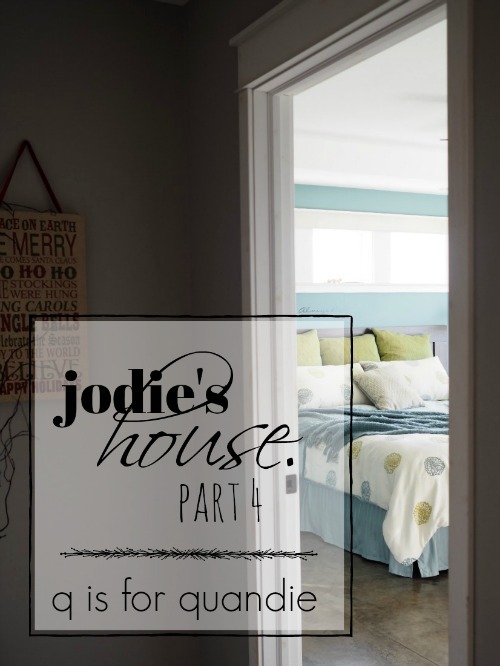 Thank you Jody for sharing your house and than you Linda for shraring her house on your blog! So beautiful! Love that bathtub caddy. And that view. Love it all. I thought that bathtub caddy was a brilliant idea! Thanks to you and Jodie for sharing-I have enjoyed the tour. Love the bath caddie, luck has it I have a piece of ladder in my stash! 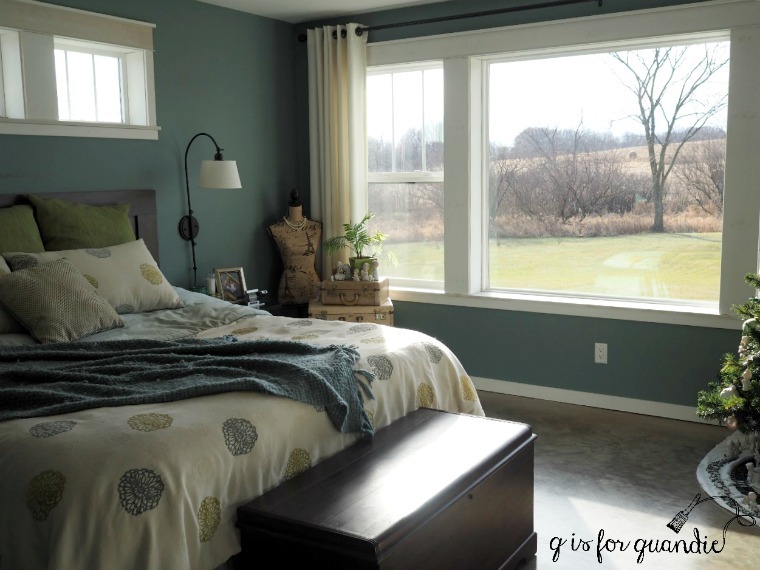 I love the color of the walls in the bedroom, so peaceful. 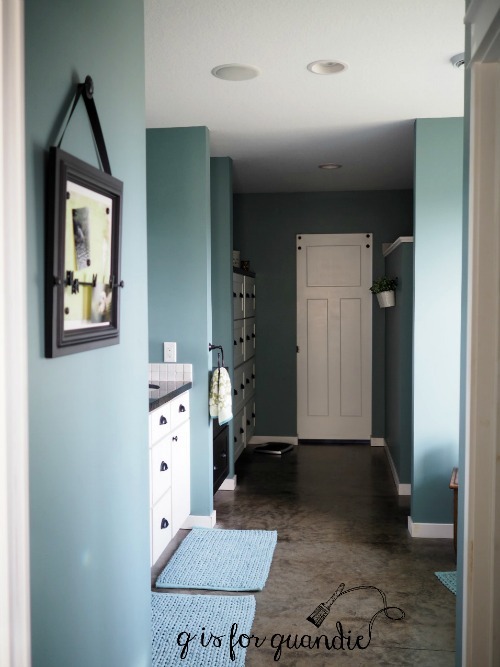 The floors are gorgeous and add a natural feel. I am amazed at how you were able to photograph her entire house and it looked ‘staged’ it is so beautifully decorated. She must never sleep! Thanks for sharing Jodie and Linda. I think Jodie worked really hard getting her house ready for it’s close up 😉 But I also suspect that Jodie’s house looks pretty good all the time. It really is the perfect house for entertaining, isn’t it? It was definitely one of my favorite house tours. Thanks Jodie for sharing your house with us. Lunch was really good too! That was a delicious lunch! Lovely home enjoyed today’s tour I have to make time to see the rest. I love your home. The beautiful tub with the lovely saying, “get naked”. 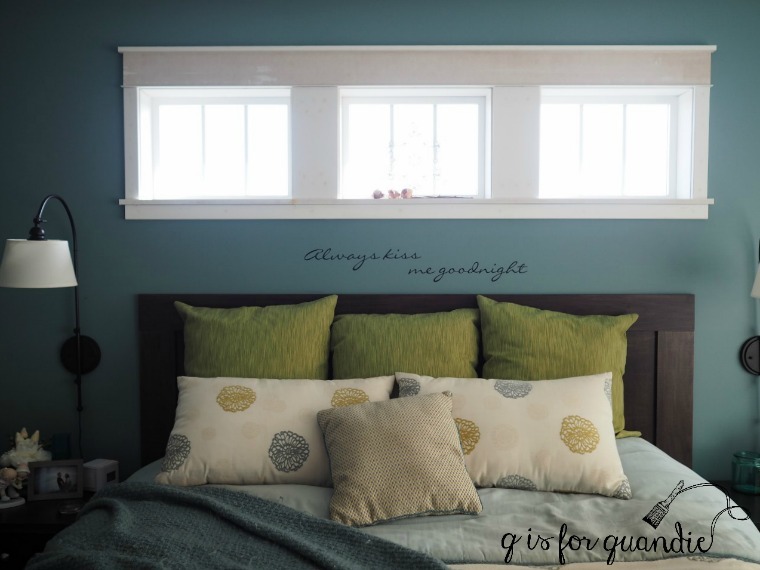 Your bedroom with the beautiful saying, “always kiss me goodnight”. Thank you for sharing Jodie’s house with all of us. What a treat! I loved the “get naked” in the bathroom and the ladder too. Thanks so much for sharing. It was my pleasure Monica!